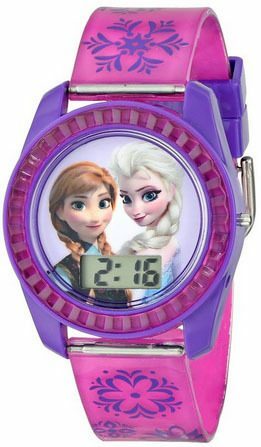 Disney Frozen Anna and Elsa Digital Watch Only $9.99 + FREE Prime Shipping! You are here: Home / Great Deals / Amazon Deals / Disney Frozen Anna and Elsa Digital Watch Only $9.99 + FREE Prime Shipping! Who has a Frozen fan at home?! I have a GREAT gift idea for you! Grab the Disney Frozen Anna and Elsa Digital Watch for $9.99 + FREE shipping with Amazon Prime or Super Saver Shipping! My daughter has been wanting a watch, and this one would be perfect for her! She loves Frozen, and it’s an easy way for us to teach her how to tell time!